First up, the critters. Banjo's on the left with some sweet vintage kitty fabric from Jessie's mom, that was left over from a dress I made for Adelaide. 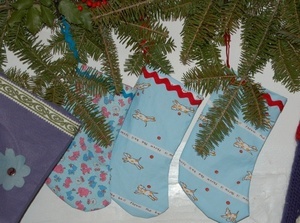 And then the doggers each get one with the Munki Munki dog fabric that I love. I kind of forgot until writing this that I actually need to *get* something to put in their stockings. Oops. And the wee ones. 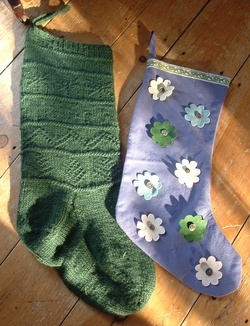 Calvin's on the left is also from the book Christmas Stockings, again with Lamb's Pride yarn. It's very cute, but every year I need to reattach the damn snowflakes that always fall off. 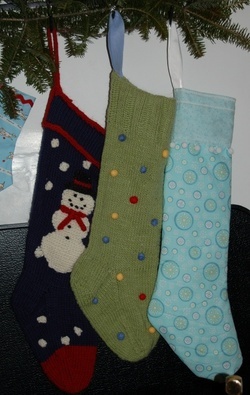 Ezra's in the middle is my favorite (if I may be so partial), it's a basic sock pattern that I just made really big, with ribbing at the top, and sewed on felt balls that we made. I took some inspiration from an Anthropologie baby sweater I was coveting at the time. And then last, is Adelaide's--put together last week. Not sure if you can see it, but I quilted it onto some batting, lined it, and added some pompom fringe and rick rack (of course). Even after my post about it, I was really lacking any inspiration for it, and I think it kind of shows. 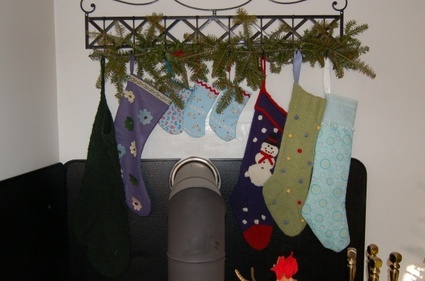 I can't wait for a cup of hot chocolate and full stockings by the woodstove! Cozy!